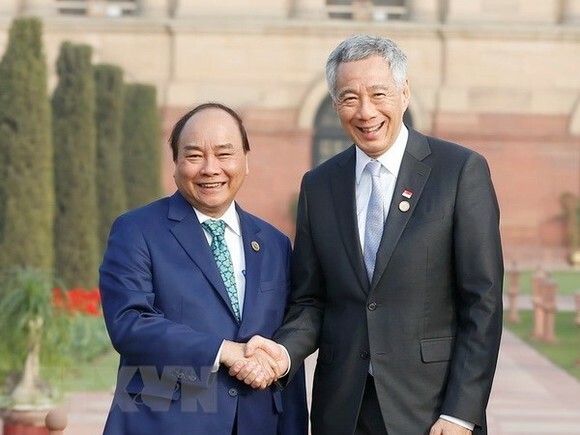 Prime Minister Nguyen Xuan Phuc is to make an official visit to Singapore from April 25-27 and attend the 32nd ASEAN Summit from April 27-28, which is expected to further foster the already sound partnership between the two countries. This is the first official visit of PM Phuc to Singapore, which coincides with the 45th anniversary of bilateral diplomatic relations and five-year bilateral strategic partnership. Singapore and Vietnam set up diplomatic relations on August 1, 1973. Since 1991, especially since when Vietnam became a member of the ASEAN in 1995, bilateral ties between the two countries have grown rapidly. In 2004, the two sides signed a Joint Declaration on Comprehensive Cooperation Framework in the 21st Century, which enabled them to boost all-round partnership. In September 2013, the two sides lifted ties to a strategic partnership during the Vietnam visit of Prime Minister Lee Hsien Loong. The two countries have maintained regular political consultations at deputy foreign ministerial level. As of December 2016, they held 10 political consultations and 5 exchanges between the two Ministries of Foreign Affairs. The Defence Ministries of Vietnam and Singapore signed a memorandum of understanding on cooperation in September 2009, while exchanging many visits at ministerial level. Vietnam and Singapore have coordinated closely at multilateral and international forums such as ASEAN, the Asia-Pacific Economic Cooperation (APEC) forum, the Asia-Europe Meeting, and the United Nations. Regarding strategic security issues in the region, including the East Sea matters, the two countries have actively cooperated, shared viewpoints and protect the common stance of the ASEAN. Since 1996, Singapore has been one of the biggest economic partners of Vietnam. Two-way trade increased through years, reaching 8.3 billion USD in 2017. Major products traded between the two countries include petrol, computers, electronics and spare parts, and telephones. Vietnam also exports to Singapore aquaculture products, coffee, cashew and vegetable. Singapore’s investment in Vietnam has risen continuously since 1998. As of the end of 2017, Singapore was the third largest out of 126 foreign investors in Vietnam with more than 1,900 projects worth nearly 42 billion USD. Singaporean firms mostly invested in Vietnam’s real estate, processing and manufacturing industries, and construction. Meanwhile, Vietnam has 65 projects in Singapore, mostly in oil and gas, mining, retail, information technology and service. A Connectivity Framework Agreement between the two countries was signed in 2005, focusing on six areas of finance, ICT, education-training, transportation, investment, trade and service. Under the deal, Vietnamese and Singaporean Ministers of Industry and Trade meet every eight months to review the implementation of the agreement and make plans for future cooperation. So far, 12 meetings were held. The Ministries of Foreign Affairs of the two countries have signed an agreement on cooperation in training high-ranking officials of the Communist Party of Vietnam in Singapore for 2013-2015, 2015-2017 and 2017-2019. The Singaporean Government grants scholarships for Vietnamese students every year. Currently, about 9,000 Vietnamese students are studying in Singapore. In the area of culture, the two sides have affiliated within the framework of the ASEAN Committee on Culture and Information. Singapore is now one of the important tourism markets of Vietnam, and a popular destination for Vietnamese tourists. Vietnam and Singapore have worked together in a project to export salinity sand to Singapore and evaluate environmental effects due to sand exploitation in rivers. The two sides have also enjoyed fruitful cooperation in aviation, maritime and road transportation, along with law, justice, and finance-banking. The Vietnamese community in Singapore has expanded to about 12,000 people.